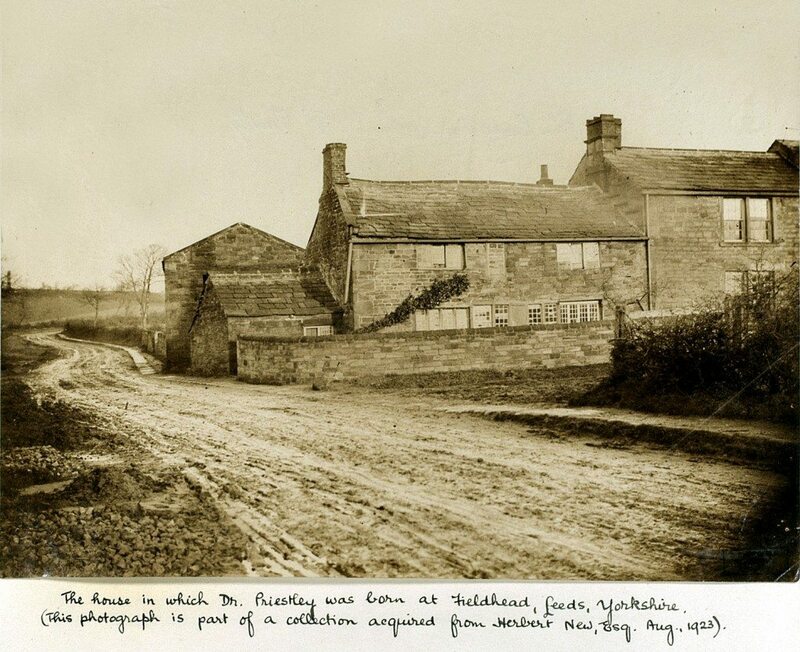 Image: Birthplace of Joseph Priestley, Fieldhead, Leeds, Yorkshire. Joseph Priestley was born into a family of woollen cloth workers and dressers in the West Riding of Yorkshire, just outside Leeds, in 1733. He came from a modest but comfortable craft background. However the family was disrupted early on by the death of his mother, which resulted in Joseph and his five siblings being raised by an aunt and uncle who were markedly better off. His adoptive parents were Calvinists, albeit fairly liberal-minded Calvinists, and they would have a powerful influence on his subsequent development. His formal schooling seems to have been spasmodic and to have consisted mainly of stints at Batley grammar school and home instruction from visiting Presbyterian ministers. In this respect his early years bear a resemblance to those of James Watt, the steam engine pioneer and future Lunar associate. Watt had a rather similar Calvinist upbringing leavened with attendance at the grammar school in Greenock. Watt, also, was an experimenter and tinkerer from an early age.